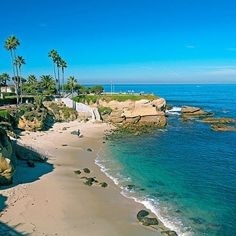 La Jolla is a community within the city of San Diego, California. It is a hilly seaside community, occupying 7 miles of curving coastline along the Pacific Ocean within the northern city limits. La Jolla in Spanish means "The Jewel", and with some of Southern California's most beautiful coastline, La Jolla is considered by many to be the jewel of America's Finest City. Located 12 miles north of Downtown, La Jolla is defined by rugged ocean bluffs, steep canyons and hillsides culminating at Mount Soledad. Since the 1880's, La Jolla has been a favorite vacation destination because of its exceptional weather and wide variety of hotels, shopping, dining, events and attractions. Due to its importance as a visitor destination, La Jolla has been designated as a special community of regional and state-wide significance by the California Coastal Act. La Jolla is home to the Scripps Institution of Oceanography, the Stephen Birch Aquarium, University of California, San Diego, and the San Diego Museum of Contemporary Art. The estimated population is 48,228. Average income is approximately $154,914. Averaged detached house is approximately $4,294,533.